Dallas, a Net Entertainment (NetEnt) slot based on the oil-mining theme, is full of free spins, bonus features, and multipliers, challenging players to win a top fixed jackpot of 10,000 coins. Playing Dallas is just as easy as activating the required number of paylines, placing a bet, and spinning the reels to create winning combinations. Players can bet up to 10 coins per active line and choose from coin values ranging from $0.01 to $0.50. The max bet is $125.00 per game. The slot also comes with features such as Autoplay and Skill Stop. Players who enjoyed viewing an American soap show called Dallas, which relates the tale of a wealthy cattle ranching and oil mining family called the Ewings, will be delighted with this slot as it brings to life the popular soap show. 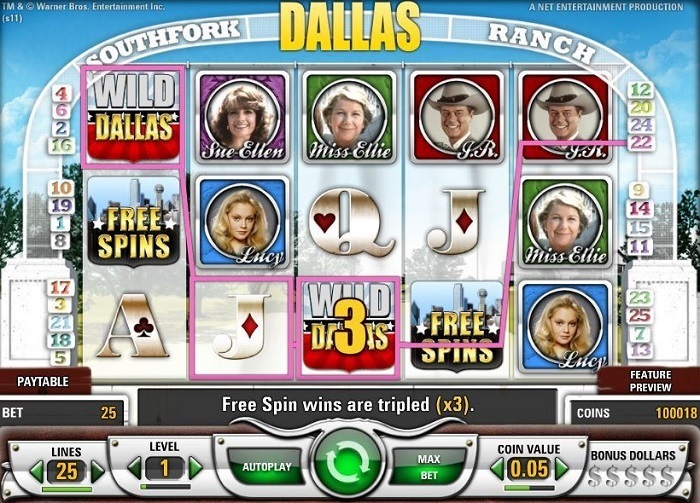 The slot features icons of popular Dallas characters J. R. Ewing, Miss Ellie, Sue Ellen, Jock, Lucy, and high-value card symbols. The sound effects, background music, animations, and graphics are lifted directly from the popular soap show. The wild Dallas Logo symbol can be used to complete winning combinations and win extra payouts. However, players cannot use it to unlock the bonus features as it does not substitute for the scatter or the bonus symbol. If players land five Dallas Logo symbols along an active payline, they will win the 10,000-coin jackpot. Dallas has two scatter symbols—the Dollar Sign and the Free Spins symbol, which do not have to appear along an active payline for players to unlock bonus features. If players land two, three, four, or five scatter symbols, they will win scatter payouts of x2, x4, x25, and x100 their bet amounts, respectively. If players land at least three Free Spins symbols anywhere on the reels, they will unlock the free spins round. The game offers 10, 15, or 25 free spins with tripled wins for combinations of 3, 4, or 5 Free Spins symbols, respectively. Players can re-trigger this feature during a free game to get some more free spins. The dollar sign symbol appears only on the third reel, and whenever it appears, it is stored for future use. As soon as players collect five Dollar Sign symbols, the Ewing Oil Bonus Game gets activated. This is an exciting investment game, in which players are challenged to invest in oil wells and rake in profits in the form of multipliers. Players can win a maximum multiplier value of x5 in this feature in addition to plenty of coins. Dallas is available for fun or real money at any NetEnt online casino. If players really get into the shoes of J. R. Ewing, the wealthy, scheming, and greedy oil baron, they may win as many as 300,000 coins.